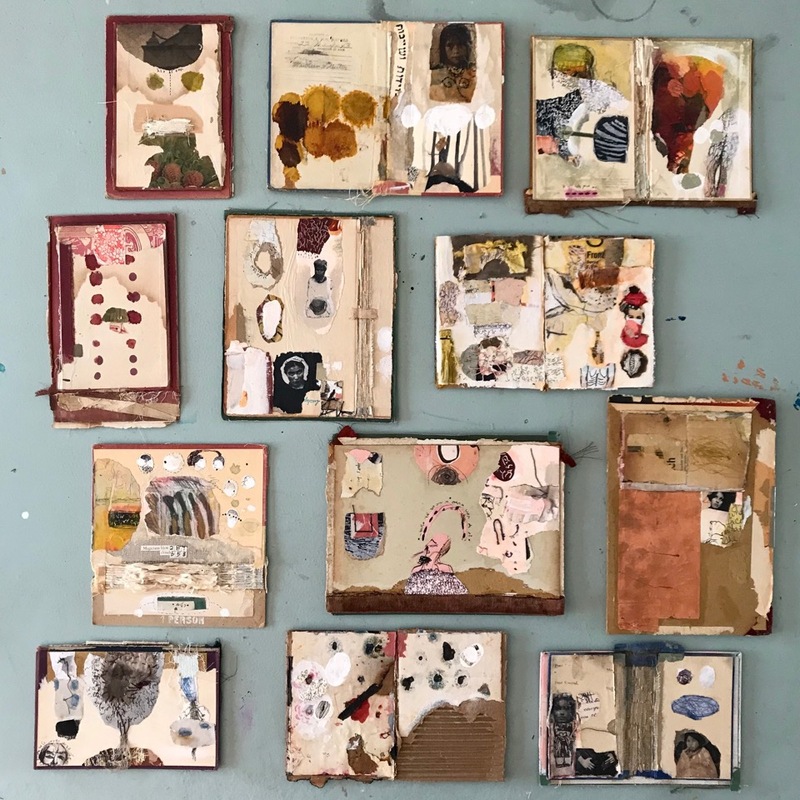 Practices of mixed media art making cultivate insight into the nature of the creative process and its multiple relations to emotional stories of loss and mend. Enriched by self trust and acceptance, images, photos, paper, paint, words, pen, line, thread, and many unconventional tools and materials entwine to make expressive, complex and extremely personal creations. It's all about one's willingness to reveal vulnerability and rawness for the sake of true creative freedom, newness, and a deep sense of interconnectedness to all. Experiencing honest and joyous journeys takes precedence over producing beautiful outcomes. Ultimately, this process is about depicting the fluidity of life, about effortlessly carrying one's self from one place to another and about connecting to a larger world than our own. In MIXED, we will explore the life and nature of a different substrate, the inside of vintage book covers. These were hard covered books that were once bound a certain way, with signatures and thread, and had a cloth exterior. They had a mysterious life which we will ‘uncover' and then inject new life into them. We’ll bring in bits and pieces of other elements that have previous stories and histories as well, and create new separate collages from which we’ll draw inspiration for our final book cover pieces. Mixed media processes will be introduced and used to create pieces only you can put together. Your own creative ways and preferences will surely culminate in one of a kind creations that will make us feel lively and content as art making always does. -White Gel pen (Signo Uniball, Sakura, etc.) and a fine permanent black pens. Meaningful to you ephemera: Old photographs, miscellaneous papers and materials from personal collections, old journal pages, paintings, letters and personal notes, clippings, bits, and odds, etc. Please make it personal! Photocopies of small images printed with a laser printer (as opposed to an inkjet). Additional tools and materials needed for this class will be provided. Our Retreat is held at Unity Farm in Sherborn, MA, only 45 minutes from downtown Boston and Logan Airport. We will be located in a beautiful 1830's New England house, on over 20 acres of land. Please note the workshop is held on the top floor of the house, with stair access. Please note deposits and registration fees are non-refundable. If registering before 7/31/2019, A $100 deposit is required to hold your spot. Balance is due in full by 7/31/2019. If registering after 7/31/2019, the full balance is due at registration. Payment plans available upon request. If you are local or renting a vehicle, you can get to the workshop off the Mass Turnpike. However, if you don't have a car, you can still make it! Contact us beforehand to set up a pick up time, and take the Commuter Rail to Ashland! Flying into Boston? Take the SL1 Silver Line bus out of Logan Airport. Get off at South Station, and take the Worcester Commuter Rail line to Ashland. We will arrange for you to be picked up (but please contact us to arrange beforehand). I truly believe that the need to be witnessed by the self and by others is a human core need to be fulfilled by the act of creating. Therefore, a compelling part of my journey is the teaching of art making and visual journaling. As a young adult in Israel, I had studied Fine Arts in an artists’ village nestled at the foot of Mount Carmel overlooking the Mediterranean Sea, and later, in the Netherlands, Graphic Design at the University of Arts in the contemporary yet history-drenched city of Utrecht. Now living by the beach of Southern California with my family, I take in all the magnificence of the landscapes that shaped me and of the visual languages I have acquired along the way. I am passionate about the process of marrying multiple media to create a unique visual experience for both the eye and the spirit. To learn more, visit Orly's website.